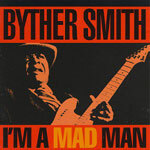 CD review: "I'm A Mad Man"
For many years known only to those who had seen him live or found one of his too rare 45s, Byther Smith is finally getting the attention he deserves. The veteran Chicago singer/guitarist's second national release ("Housefire," originally a small-label release, was reissued by Rounder in 1991) is an intense, fierce bit of blues that will grab any listener's attention. Smith is from the old school of blues, but he writes material that sounds as contemporary and modern as anything the younger generation is putting out. While he writes and plays Chicago postwar electric blues, he does so with clean guitar lines, gritty vocals and tight arrangements, making his music completely accessible without compromising it in the least. The production is far better on this release than on "Housefire." The sound quality is outstanding, the packaging polished. Complaints? One one  the inane opening paragraph in the otherwise evocative liner notes by Mark Datema Lipscomb: "I wouldn't be surprised to find out that there are more theories about what makes a 'real' blues record than there are unlicensed handguns, although handguns probably pose less of a threat to society." But there's no reason to hold the liner notes against the album; Smith didn't write them. All he does here is play his heart out, laying down one of the best blues albums of 1993.